The Canadian Mental Health Association, Ontario (CMHA, Ontario) wishes to make a written submission to the Standing Committee on Justice regarding Bill 107 an Act to amend the Human Rights Code. Our comments pertain to Bill 107, inclusive of its proposed amendments dated November 15, 2006. This submission is in place of our presentation to the Committee scheduled for December 2006, which has been cancelled. CMHA, Ontario is a provincial association dedicated to promoting the mental health of all individuals and communities in Ontario by providing leadership through knowledge enhancement, policy development, advocacy, and the advancement of best practices in service delivery. Mental illness can happen at any time to anyone. It affects 20 per cent of Ontarians at some point in their lives with most episodes occurring during prime working years. Our submission will focus on the issue of mental illness as a disability in the workplace. Depression, bipolar disorder and anxiety are some of the most commonly mental disorders experienced by persons in the workplace. The cost of untreated mental illness in the workplace results in lost productivity, increased disability insurance claims, and use of social and health services. This is an economic issue and also a human rights issue. Fifty-four per cent of total complaints filed with the Commission are on the grounds of disability and 78 per cent of complaints are employment-related. Disability complaints in the workplace represent almost 28 per cent of new complaints, more than any other combination of grounds and social area. In monetary damages awarded in settlements, disability leads as grounds for discrimination. Employment as social area tops the list at over 80 per cent for cases completed or referred. In 2005-2006 the Commission received 1037 complaints on the grounds of disability in the area of employment. Mental Health Works is a public education and training initiative of CMHA, Ontario delivered by 26 CMHA-accredited trainers across Ontario. 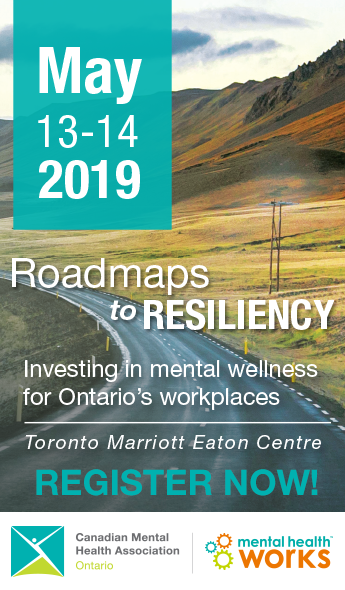 It is specifically designed to help employers and managers develop effective strategies to address the complex issues of mental health and mental illness in their workplaces through educational awareness and training. Mental Health Works training has been named as a recommended remedy by the Commission. Through Mental Health Works, CMHA Ontario has contact with hundreds of employers and employees who relate their stories in training workshops, consultations and phone and email enquiries. From this perspective, we know there is a significant problem that exists in workplaces in Ontario: the lack of understanding around human rights in the workplace, in particular when an employee has mental health issues. We continue to hear stories of people who are fired for absenteeism or while on short and long-term disability. From our experience, we know that not any individuals who have shared their stories with us have filed a complaint with the Commission, nor do we believe they will be more likely to do so under the Bill 107 proposed amendments. We suggest that for every complaint the Commission hears about, there are hundreds of situations that never receive public scrutiny, despite the fact that the Commission will have an enhanced role to investigate systemic discrimination, unless further enhancements are made to the Act. Public perception of the Commission is that the complaints process is slow, intimidating for people not familiar with law, and biased in favour of those with power and money. The resources required to weather the process are strained for many people living with and recovering from mental illness. It often affects basic needs: the ability to earn an income, maintain stable housing and maintain supportive relationships. Other resources that are required to publicly accuse someone in a position of power are self confidence, self worth, physical and mental energy, and faith in the process. These are often compromised in someone who has a disability and struggling just to overcome the day-to-day challenges of life. That the Commission’s five-year legislative review be undertaken in conjunction with the Disability Rights Secretariat, who will ensure the experience of people with disabilities be incorporated into the review process. Section 35(1) sets the application standard at 6 months, with complaints older than that deemed ‘late applications.’ Mental illness can take many months or years to be diagnosed, and many more months or years to be treated effectively. Asking people who are ill to file a complaint in the early days is like asking someone with a broken leg to run with you. Potential complainants need more time in recovery to engage in the stressful activity of taking legal action against an employer. While the November 15 amendments extend the application standard to one year, from the position of people with mental illness, this is not enough time to gain enough health to launch a complaint. That the standard application period be increased to 2 years. Both employers and employees have rights and responsibilities under the human rights code in reference to the legal duty to accommodate for disabilities. Most employers know they have the legal duty to accommodate, but often don’t know how to effectively accommodate when the disability is a mental illness, how accommodation applies to their workplace and what is meant by undue hardship. Most employees do not know that they have a right to accommodation. Many workplaces treat accommodation as a one-size-fits-all process, and do not meet the individual needs of the employee with the disability. The courts have interpreted accommodation quite broadly and undue hardship quite narrowly. Employers need more and better information than they get from legal counsel on how to apply the law in their workplaces, especially in the complex area of mental Illness. Employees who are struggling with mental health issues do not know how to make the accommodation process work for them. Often company policy and workplace practices unknowingly infringe an employee’s human rights and impair the smooth process of creating an accommodation. Fostering a human rights culture in our workplaces begins with education and training. That the Commission’s enhanced education function include funding and promotion of initiatives already named as remedies for education and training. To enter into the complaints process, individuals need accessible expert legal advice and guidance. Initially CMHA Ontario was very concerned that this pillar appeared to be an add-on and did not appear to have the commitment of the government to provide fully accessible and affordable legal assistance to all applicants. We applaud the November 15th amendments to address entrenching legal support services in the Act. However, we continue to have questions about the funding of the Human Resources Legal Support Centre. If its funding is static, what happens if there is an increase in complaints? We are concerned that these overflow complainants will not receive full legal service. Also the legal services need to be accessible to accommodate the needs of people with mental illness. Funding should be afforded to the Human Rights Legal Support Centre on the basis of need determined by the number and nature of complaints, with flexibility for increases if the number of complaints rises. Many people with a mental illness have difficulty dealing with stressful situations while they are working towards regaining their health. The legalistic and confrontational culture of the complaints process is a barrier for people with mental illness. This is an accessibility issue, and we believe is a significant barrier, preventing many legitimate complaints from being made. Under the November 15th amendment regarding legal support services, require that all staff in the Human Rights Legal Support Centre and all Commissioners have specific, focused and practical training on meeting the needs of complainants and potential complainants who have mental health issues to reduce effect of litigious process barriers. That the Commission, under its mandate to investigate issues of systemic discrimination, examine the complaints process for accessibility barriers for people with mental health issues.